"Have you ever planned on making stew for dinner but forgot to take the meat out of the freezer? 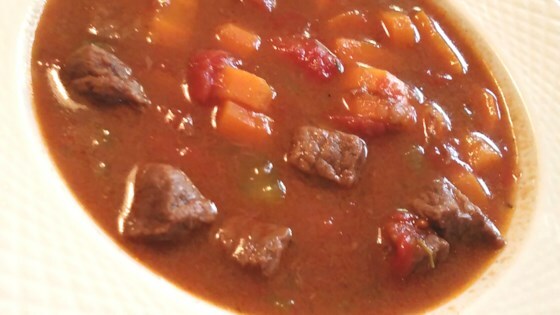 This happens to me all the time so I developed this beef stew recipe using frozen meat." Turn on a multi-cooker (such as Instant Pot(R)) and select Saute function. Heat oil for 1 minute. Add onion and garlic; cook and stir until onion begins to soften, about 5 minutes. Pour in red wine and continue cooking until wine has reduced by 1/2, about 3 minutes. Add beef broth, thyme, parsley, oregano, bay leaf, salt, and pepper; stir to combine. Add tomato paste and stir. Place frozen meat on top. Add potatoes, carrots, and celery. Close and lock the lid. Close the vent. Select Meat/Stew button according to manufacturer's instructions; set timer for 45 minutes. Allow 10 to 15 minutes for pressure to build. Release pressure using the natural-release method according to manufacturer's instructions, about 10 minutes. Carefully move the vent to release remaining pressure using the quick-release method according to manufacturer's instructions, about 5 minutes. Unlock and remove the lid. Mix water and cornstarch in a small bowl and slowly pour into the pot. Select the Saute function and cook until slightly thickened, 3 to 5 minutes. See how to make a classic stovetop beef stew. I didn't have potatoes so I added green beans at the end. Also, I used a pack of Lipton onion soup mix instead of the spices. It was great! Delicious! So easy to make. I'll be adding this to the family favorites!